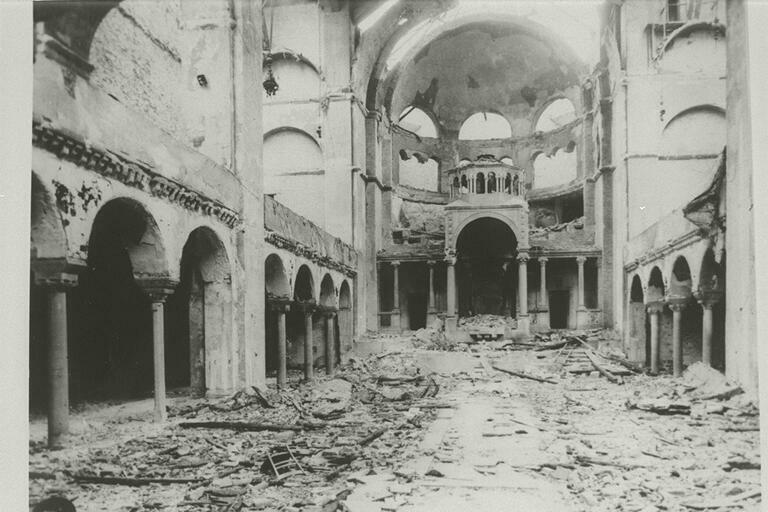 9 November 1938, the ‘Kristallnacht’ pogrom was the first step towards the extermination of the Jewish Europeans by the nazis. SA Storm Troopers and civilians destroyed more than 8000 Jewish homes and shops, set synagogues on fire, imprisoned, injured and killed Jews all across the country. 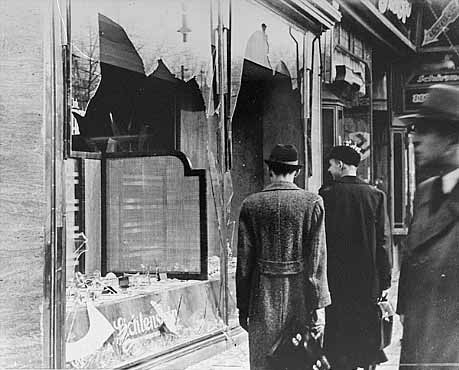 Pieces of broken windows covering the streets in many German cities gave rise to the name ‘Kristallnacht’ which freely translated means the Night of Broken Glass. Today this pogrom is seen as the symbolic beginning of the Holocaust, the systematic eradication of Jewish people which started with the discrimination and exclusion of the German Jews since 1933 and which eventually led to the murder of 6 million Jewish people and 5,5 million ‘enemies of the German state’: homosexuals, criminals and ‘asocial’ people, members of diverse religious communities, people with mental disabilities, political ‘offenders’ such as communists and socialists, Spanish republican refugees and minorities like Roma and Sinti and others. The ‘Kristallnacht’ reminds us that such terrible things did not start with deportations and concentration camps, but were developed step by step. Nazi propaganda and hate speech against Jews and laws depriving Jewish citizens of their rights (the ‘Nuremberg Laws’ i.a. stripped German Jews of their citizenship) were the first steps, eventually culminating in violence and pogroms. Why campaign on 9 november? Do we even need to ask this question? We need to make sure the past is not forgotten. Fascist groups again search for scapegoats, and encourage us to hate our neighbour. We must be aware that the Holocaust happened with the silent acceptance and support of the broad majority. Nowadays, hate crimes are frequent realities, extreme right-wing parties are elected into parliaments and xenophobic propaganda is becoming legitimate in societies. 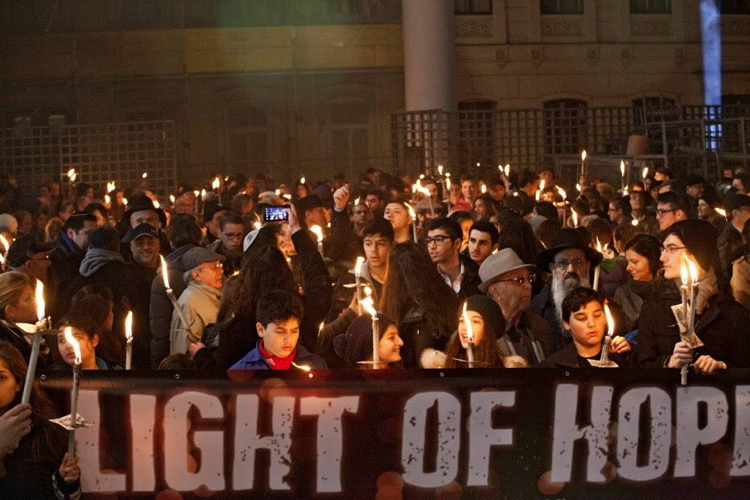 It is the duty of a democratic European civil society to transmit generation by generation a collective memory based on the concept “Holocaust – Never Again” as a way to overcome hatred, right-wing extremism and totalitarian ideology. Thus, when we say “Never Again”, it means that we commit ourselves to do everything in our power to prevent persecution, oppression, and genocides by totalitarian regimes before they can manifest. Since 1992 the UNITED network stimulates and coordinates around 9 November the International Day Against Fascism and Antisemitism and calls upon the international community to bring an end to hate. The aim is two-fold; firstly, we commemorate victims of the ‘Kristallnacht’ pogrom and victims of fascism throughout history. Secondly, we want people to be aware of the danger of nationalism, populism, antisemitism, right-wing extremism and neo-fascism today. We mobilise a wide variety of groups and individuals to build a common front against hate ideologies and violence. Every year, hundreds of organisations and informal groups in over 45 countries take an active part in the campaigns. People oppose hate in their communities and promote inclusion in these activities. It is time for you, too! The campaign is pluralist and open: there is place and space for all. We use different approaches but we have one shared vision of a society without hatred and discrimination, based on equality and human rights. Fascism and antisemitism is not only a local issue and this Europe-wide campaign can help to set the agenda on all levels. By linking local and national actions we make our movement visible and generate European-wide publicity. By acting together on 1 common date we draw European-wide attention from the media, the general public, and also policy makers, to our common demand. We ask NGOs, community organisations, schools, local municipalities and individuals –and YOU- to join forces and confront hate with local actions. Organise activities, join the Facebook page, check the campaign website, support others, spread the message: JOIN the 9 November Campaign and Remember!